The Law of Attraction simply says that you attract into your life whatever you think about. Your dominant thoughts will find a way to manifest. I want to believe the law of attraction ... that thinking positive thoughts and imagining good will attract good. I do believe that there are energy forces we don't yet understand and that being in alignment with those forces, whether by happenstance or focus, creates synchronicities and new opportunities. I want to believe that we live in an abundant, meaningful universe rather than a random collection of molecules playing pin ball. But, the earthquake in Japan and Haiti, the tsunami in the Indian Ocean and the 1931 floods in China which may have killed 2.5 million people all make me sure that those actions were not a result of the law of attraction. People in a small fishing village in Japan weren't thinking negative thoughts which caused their village to be washed away. The natural forces of the earth did that. So, where does that leave us with the law of attraction? Perhaps all the gurus of this belief system could back off a bit in their fervor. There is an underlying foundation of truth ... people who passionately focus on what they want in life tend to get whatever it is they want more often than people who don't. They are more focused, more vocal in letting people around them know what they want, more energized by their own passion and the energy they get from others who begin to support them. But maybe we could call it the "Power of Attraction" rather than a "law" ... somewhat like we talk about the "power of prayer" and not the "law of prayer." We shouldn't use this "law" as a club to beat people over their heads as if their cancer, their unemployment, their ten-year-old car, or their lost fishing village was the result of their negative thinking. Teaching people to stretch into their best selves, to reach for new possibilities, to find their deepest talents and gifts are all great things. We have far more potential than we use and the world needs the full brilliance of each of us. My personal belief is that life is not either/or but rather both/and. Life and Death. Pain and Joy. Meaningful and Random. We live in a meaningful, abundant Universe seasoned with random, chaotic forces. In the tragic wake of Japan's earthquake, which is completely meaningless and random, there will be a million meaningful stories of heroism and connection. For those of us untouched directly by this disaster, it is a reminder to be kind to each other, to connect with our neighbors, to find joy in each moment. The random forces of nature are fast and strong ... to survive we need each other and a firm belief in the power of our indomitable spirits and the Great Spirit that connects us all. 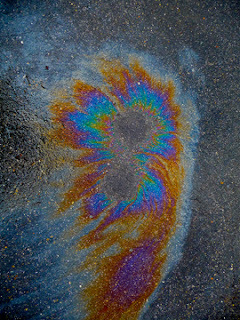 About this image: A common oil slick but it reminds me of the both/and idea. An ugly bit of oil on pavement becomes a radiant display of color when mixed with a little water and sunlight. It saddens me that a number of people on the radio (we all know their names; they're in the news) feel it's necessary to make jokes about Japan and the Japanese and to say they got what they asked for. Thank you for speaking out against that kind of behavior. I feel the same way. Great post. Thanks Maureen and John ... I appreciate your thoughts. Brilliant post Joyceann -- both and other -- powerful. You made some really good points there. I checked on the internet to find out more about the issue and found most individuals will go along with your views on this site.